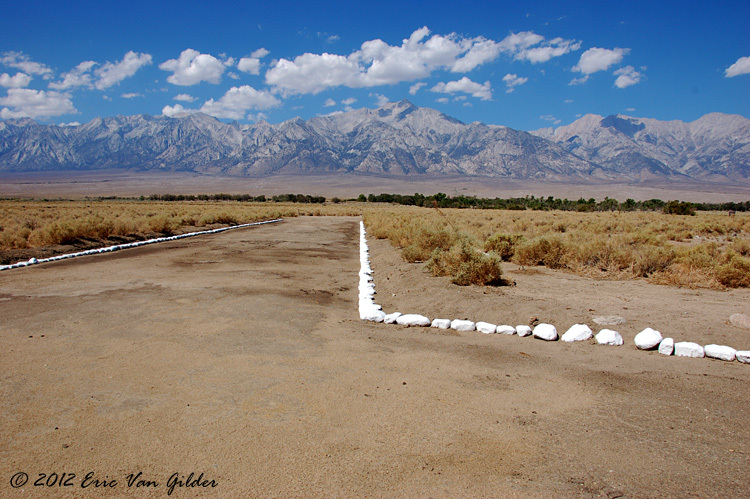 Anyone who has ever driven the 395 between Los Angeles and Mammoth Lakes, California has passed the Manzanar War Relocation Camp. It is between the towns of Lone Pine and Independence. From the road, all you can really see is the old gym/community center and a couple of sentry posts. More recently, one of the old guard towers was reconstructed. We have passed it many times over the years and I decided it was time to stop and take a look at part of the history of this country, albeit a dark part of our history. 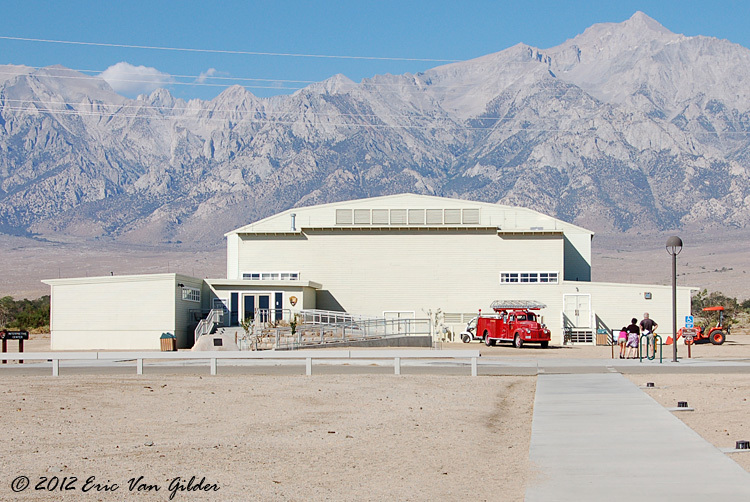 Manzanar Community Center and Gym. Today, it serves as the interpretive center and museum. The first thing you notice as you get out of your vehicle in the parking lot is how desolate and quiet it is here. It was August, and pretty warm here, with very little shade. In the winter, it was probably miserable. A little background to the history. The Japanese Navy forces bombed Pearl Harbor on December 7, 1941. A Japanese submarine shelled Santa Barbara, California and then the "Battle of Los Angeles" all contributed to the anti-Japanese sentiment in the US, especially in the western states. This photo, taken in 1942, shows the hatred that was openly displayed. 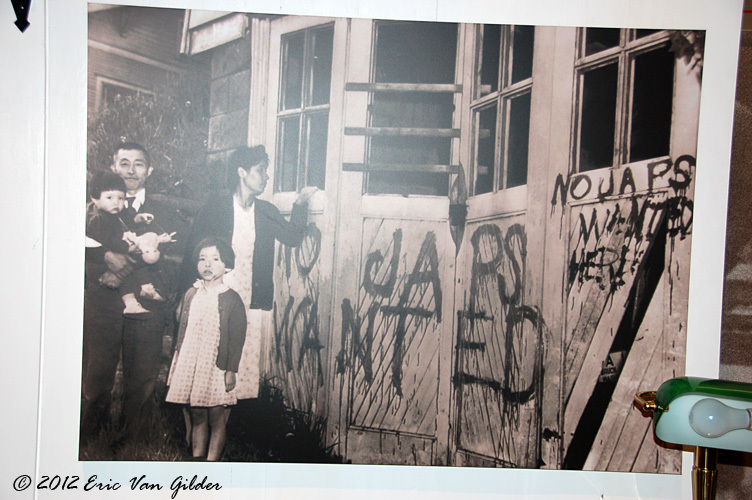 Vandalism to a Japanese American family home. On February 19, 1942, President Roosevelt signed Executive Order 9066 that authorized the US Army to remove nearly 120,000 people of Japanese ancestry from the homes and business on the west coast. Two thirds of the people displaced from their communities were American citizens. 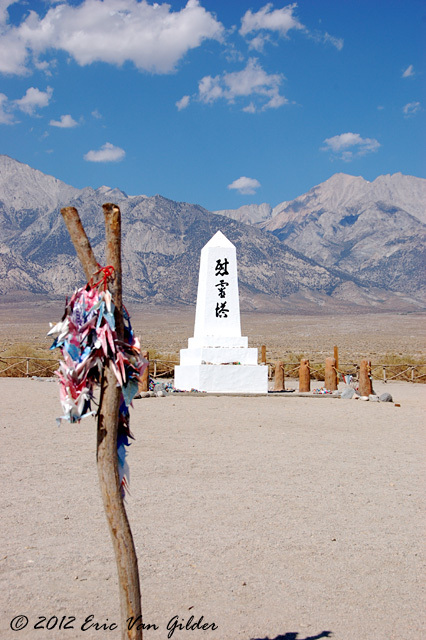 Manzanar was the first of 10 camps established to house the Nisei. One of many Japanese American businesses that were sold, almost always at a big loss because of their internment. Depending on where the lived, they were put into camps established within communities and bussed to Manzanar, or one of the other 9 camps. 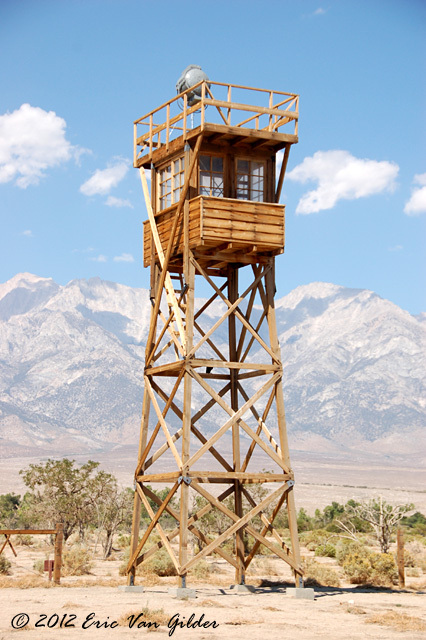 At it's height, Manzanar held 11,070 Japanese Americans. 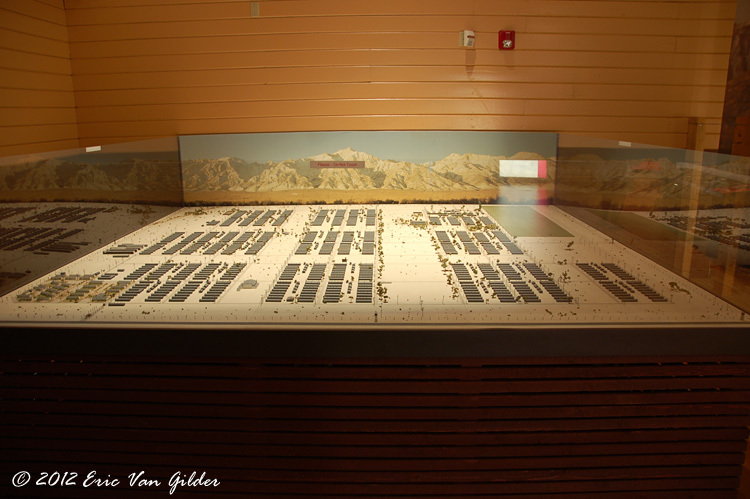 Model of Manzanar as it was in the early 1940s. The community center, that still stands today is toward the front left, in the clearing between rows. The Japanese Americans went from homes and businesses in local communities to crowded, hastily built camps in places that were out of the way and desolate. 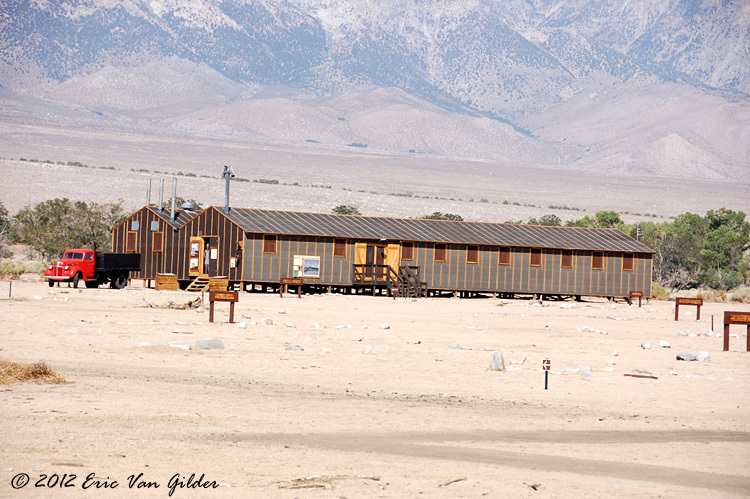 The buildings at Manzanar were constructed of wood and tar-paper. While we were there, the buildings were hot and stuffy. In the winter, they would be cold and drafty. 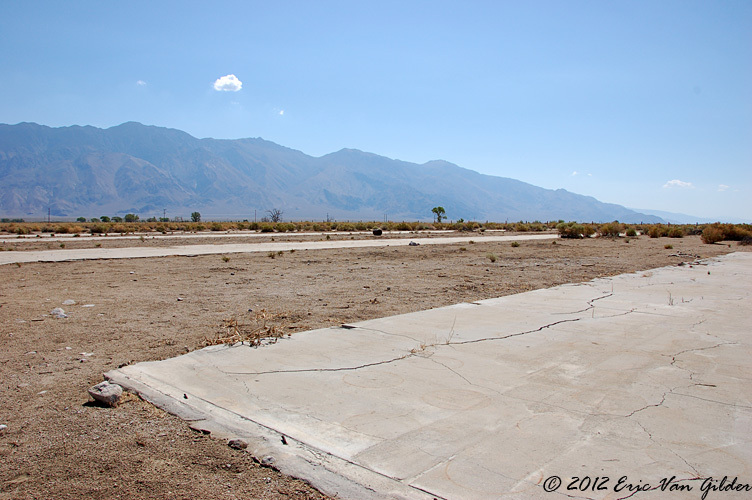 Buildings in Manzanar all were of the same basic construction regardless of their function. This is a reconstructed building used to house families. 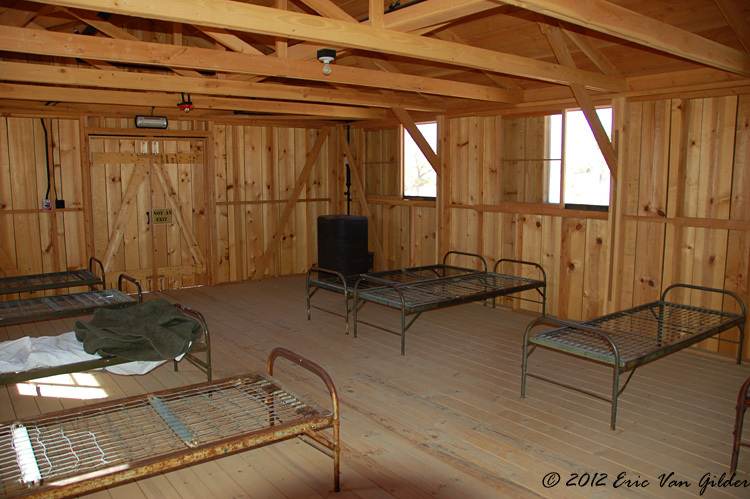 This would be the living quarters for any combination of eight people in 1942, a space of 20' x 25'. Each building housed several families and the walls between sections were simple plywood with walkways. There was little privacy and no insulation. 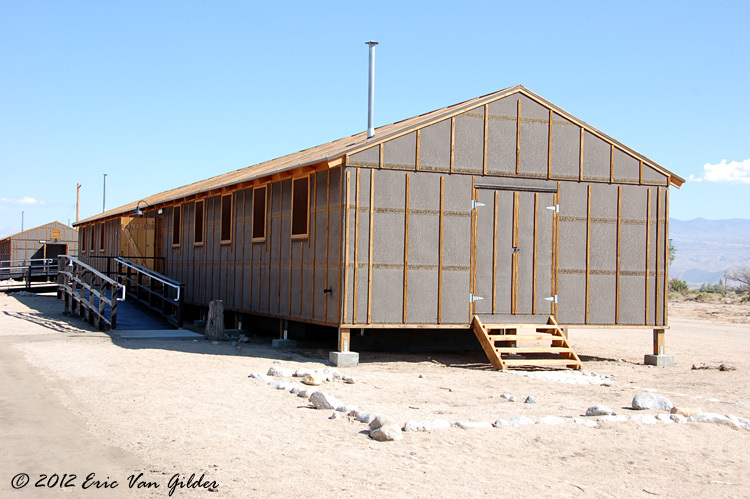 Later in the time of the camp, flooring and dry-wall were added to the buildings. Little comfort to the spartan space they got. Privacy was pretty much non-existent. 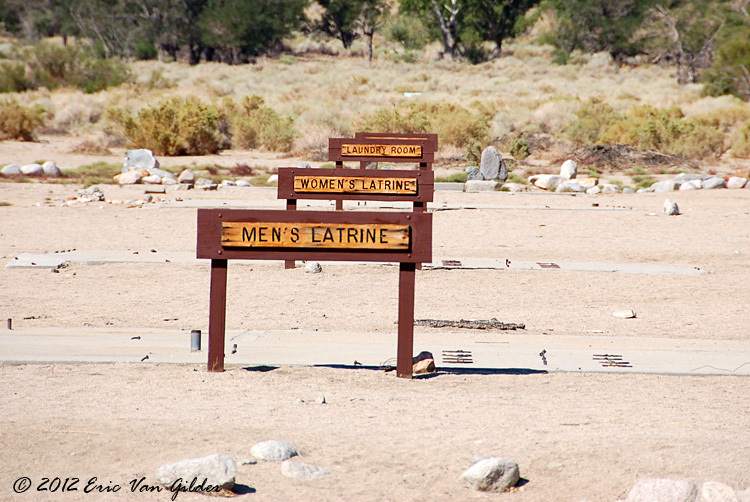 Bathroom facilities were buildings of the same construction with toilets and showers. The toilets did not have stalls, and were in the wide open in rows. Community chow halls were also in each block to feed the people. 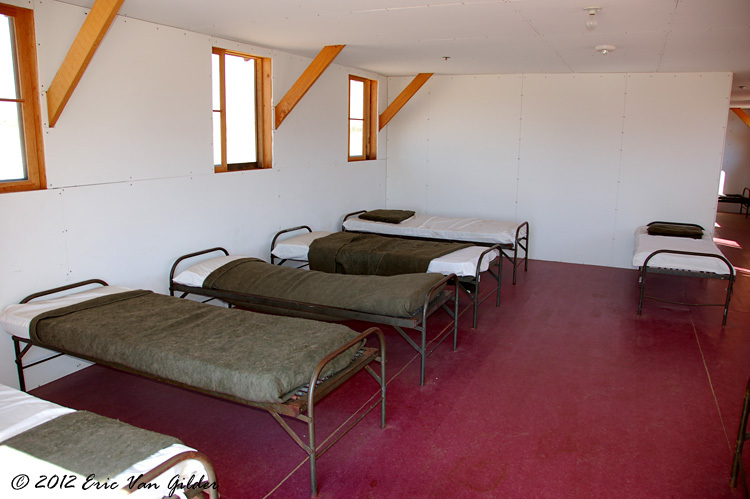 One of the chow halls at Manzanar, each "block" had a chow hall, mens and womens bathroom facility and laundry. Signs denoting where some of the buildings were in the block near the chow hall. Guard tower in the corner of the property to remind you that you were no longer free. One of the morale boosters for those in the camp were to create block gardens. With long lines for the chow hall, people would find solace in the gardens and fountains. Each block had it's own, and it was a source of pride for the block. San-shi-en garden was unearthed in 1999 by the National Park Service archeologists in block 34. Water flows through three levels, aligned North to South. The highest point symbolizes the mountains which flows to the pond, representing the ocean. 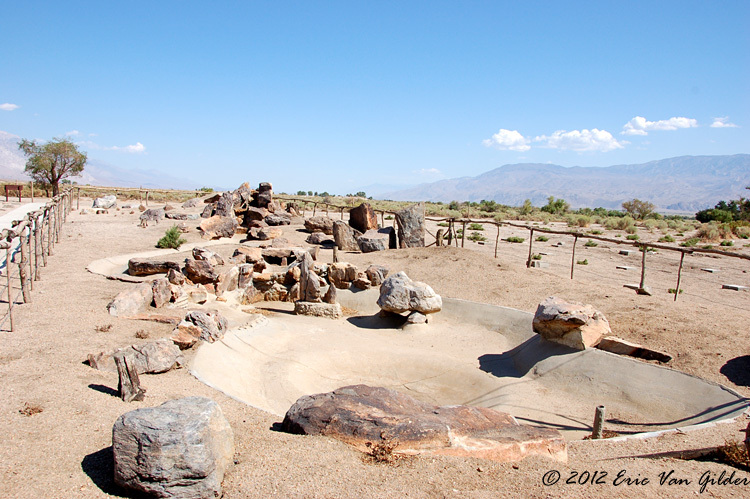 Stones were brough in from the nearby Inyo mountains and trees were planted as well to give a serene setting. Additional gardens were being excavated while we were there. The sentry post buildings and other building were built by the interneesduring their internment. 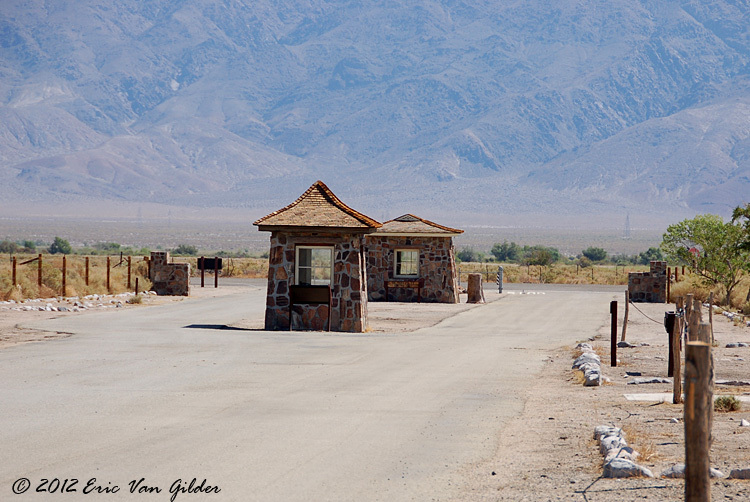 Ryozo Kado was a stonemason and built the sentry guard houses using stone from the nearby Inyo mountains. The gym/community center and other places were built by the people interned here. Military sentry post shacks built by Ryozo Kado. Just to the left of the guard shacks as you enter the camp is the traffic circle and foundation of the administration buildings. The trafic circle has a single entrance/exit. The internees were brough here by bus and had a short walk to the administration buildings to be processed into the camp. The single road in and out of the traffic circle near the administration buildings. The traffic circle near the administration area. Foundations of the administration buildings. 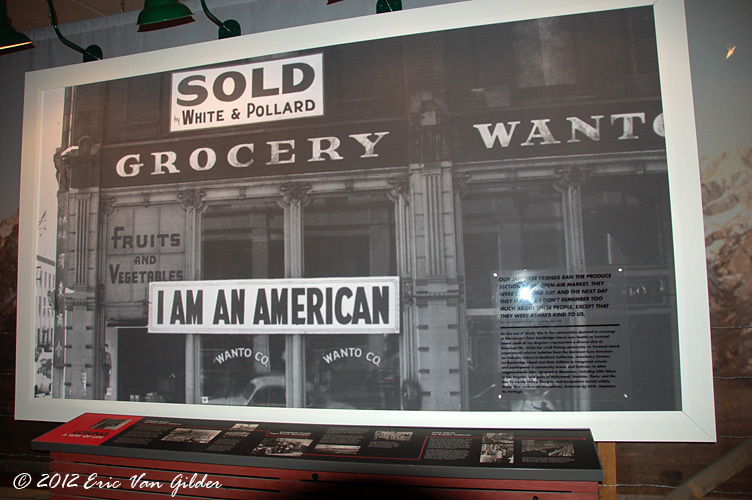 Despite being interned, the Japanese Americans made the bst of the situation. There was a school for children, an orphanage, three Buddhist temples, baseball leagues, gardens, orchards, kendo studios and even a newspaper. There was also a factory for making camouflage netting for the military. Foundations from the camouflage netting factory. 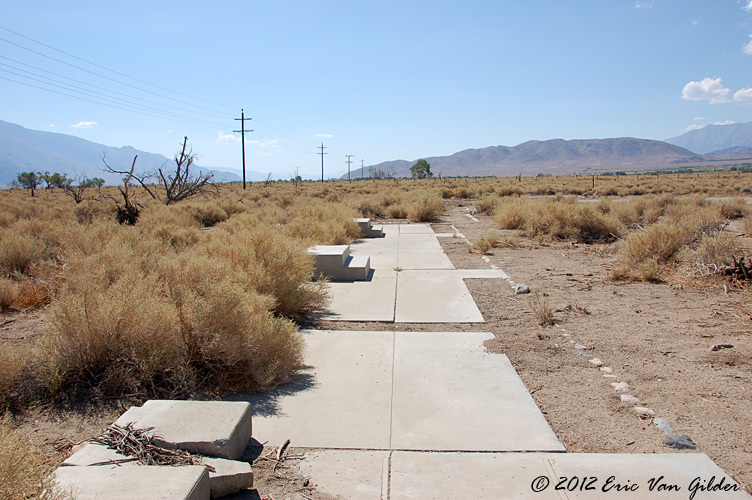 The local newspaper, the Manzanar Free Press was located on this spot. 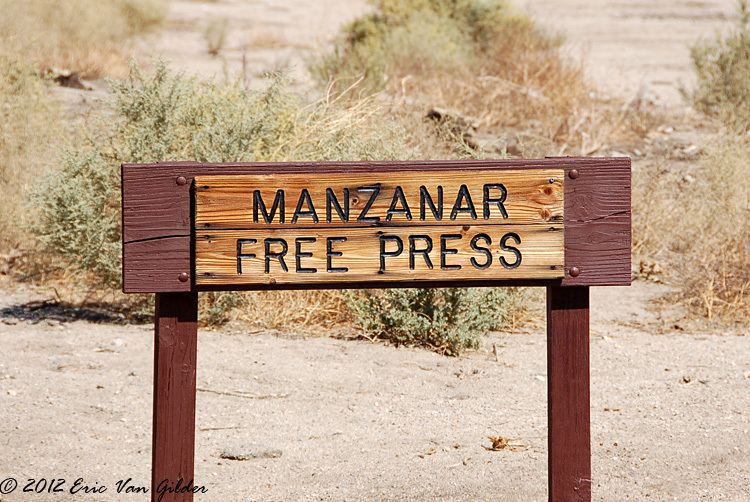 I found it ironic that the camp newspaper was the Manzanar FREE Press. 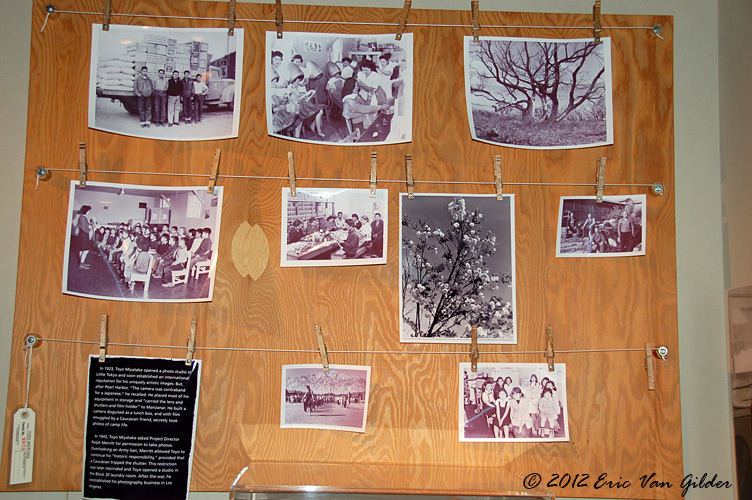 Manzanar was well documented because of Toyo Miyatake. He was a professional photographer before the war. Against Army orders, he smuggled in camera equipment to document the camp when he arrived with his wife and four children in May of 1942. He would later receive permission to take photographs in the camp. 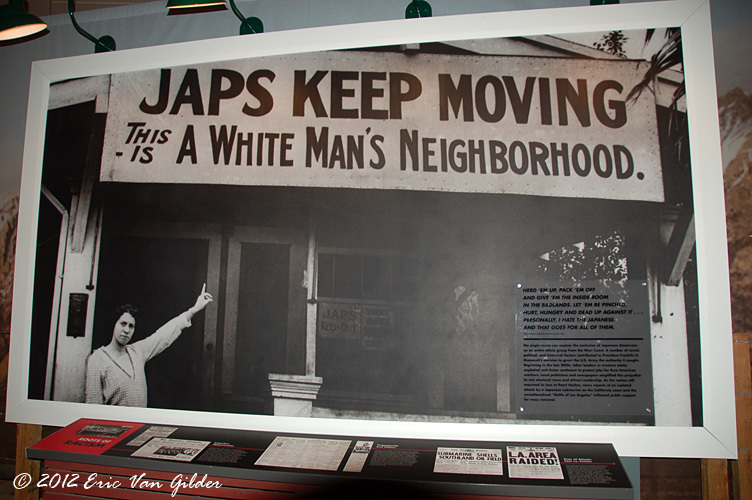 Because of this, Manzanar was probably the most well documented of the 10 camps. Toyo Miyatake set up a lab like this in one in Block 20 of the camp. 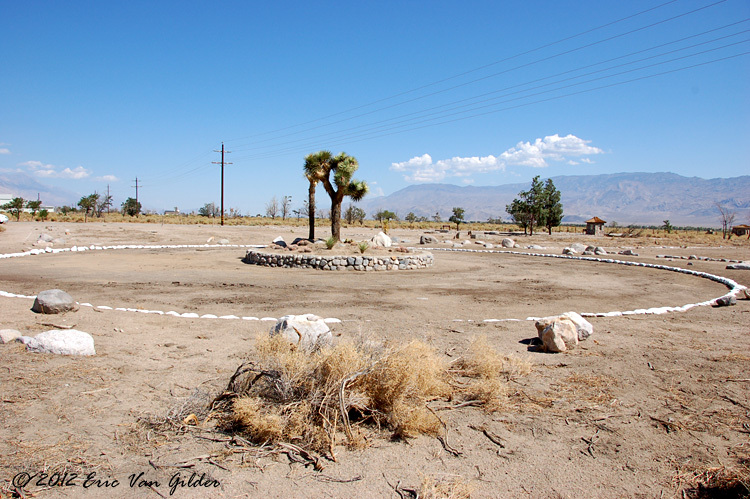 During the time of Manzanar, 150 internees dies at the camp. Fifteen of them were buried near the camp in the cemetary. Nice have since been removed and interred elsewhere. Six of them remain in this place of memorial. This part of the tour was the most moving and heavy for me. A large memorial stone stands in the middle, built by the internees. Many things are left here to memorialize the dead and the history. One thing that struck me was the Senbazuru that were left at the site. Senbazuru literally means "1000 cranes". 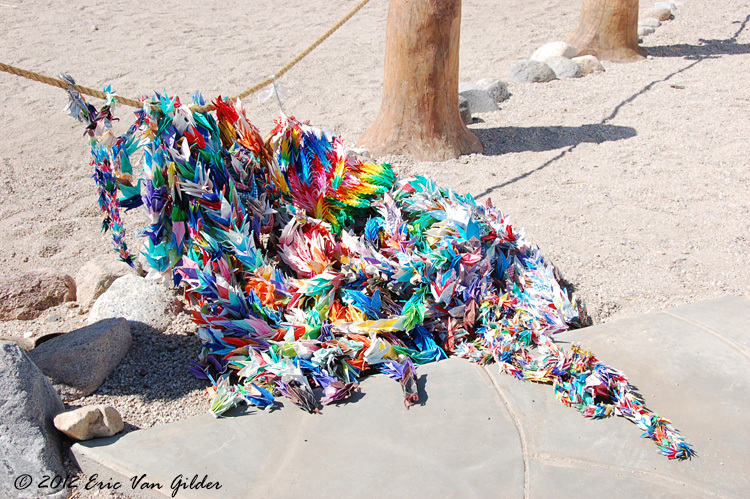 1,000 cranes are folded in origami, and strung together with string. They are used to symbolize luck, peace and healing. The legend is that if you make a senbazuru and make a wish, it will come true. As the paper cranes deteriorate and return to the earth, they release the wish. Senbazuru seen on a post at the entrance to the memorial cemetary. The front translation is "memorial tower"
The back of the memorial stone. 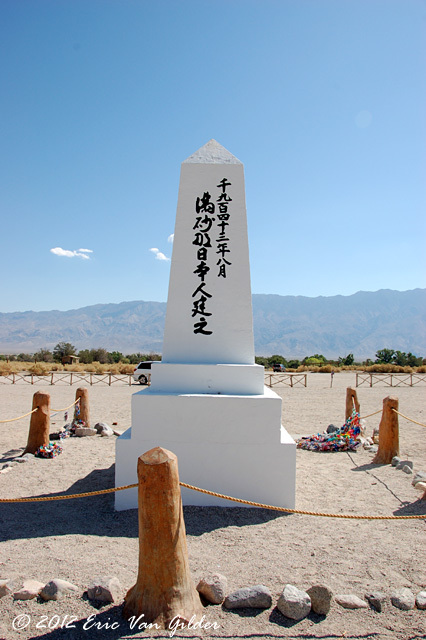 Translation: "Japanese at Manzanar built this. August 1943." 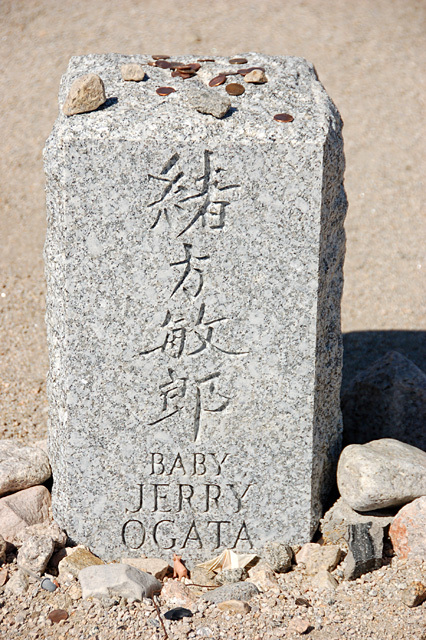 Multiple offerings are made to the dead on the memorial stone. A beautiful and colorful Senbazura left at the base of the Memorial Tower. One of the head stones in the cemetary. 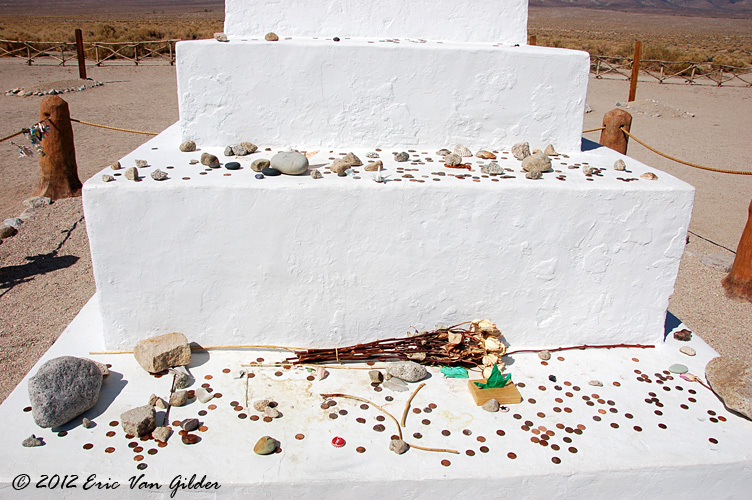 Offerings of stones and coins are left to memorialize the dead. My final thoughts on Manzanar. It was a moving and chilling experience to see. Driving past it for so many years, you don't realize the history and significance of the site. I won't pretend to understand what happened and why, and perhaps I cannot truly know the reasoning behind the sentiments of people that held such racist thoughts toward the Japanese and openly displayed them. I don't try to judge events of the past without having lived through them. But I will say that what was done wasn't right in my mind. The fact that 66% of the internees were American citizens is a frightening and chillig thought for me as a veteran. I can only hope that this kind of thing never happens again in America. 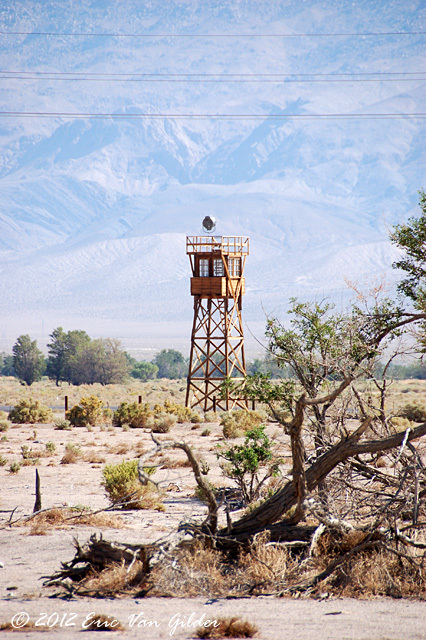 Manzanar guard tower, rebuilt a few years ago, and clearly visible from the 395 now. 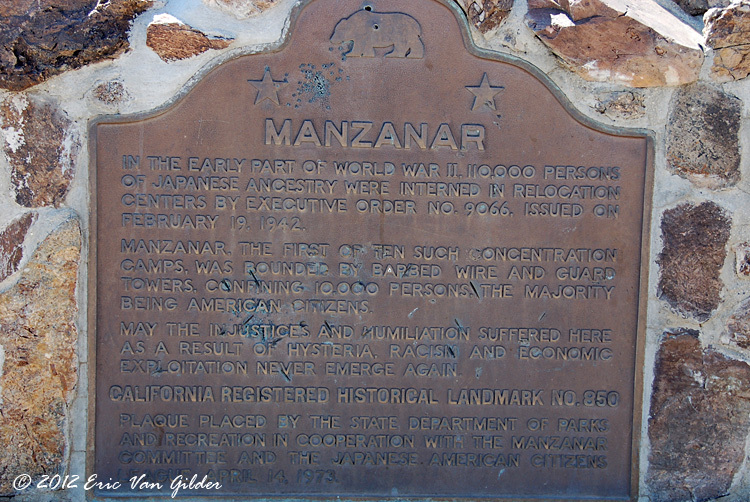 Manzanar landmark plaque. May we always remember this so that it is never repeated.